Russell enlisted in the Marines after high school and gained admission to the Naval Academy. He graduated with a B.S. 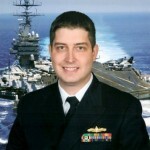 in Economics in 2009 and served as a Surface Warfare Officer onboard a guided-missile destroyer and nuclear-powered aircraft carrier. He deployed three times to the Arabian Gulf, conducting counter-piracy operations, ballistic missile defense, Iraqi oil platform defense, and air support operations. After his sea tour, Russell served as a staff officer at Naval District Washington and was a member of the Crisis Action Team during the Navy Yard shooting. Russell is pursuing his MBA at Columbia Business School in the Class of 2017.